It was all fun and games when I put on my jesters hat and poked fun at myself yesterday after recounting my insecurities concerning my debut web interview. The laughs stopped for many people when I apparently pulled out a whip and flogged myself publicly. A few of my readers contacting me privately and told me that they did not appreciate this level of self depreciation. In the name of humor, even at my own expense, I had unintentionally caused personal injury to a number of my readers by being so hard on myself. I am here now to offer restitution for that injury by giving a revised account on what happened during my debut. George, the gentleman interviewing me, scheduled for us to talk at 11:30 am CST. I didn’t get a confirmation from him, and on the day of the interview I eagerly sat in front of my PC waiting. He had not yet confirmed my skype request, and it was ten minutes to show time by then. Ah, this African man and his African time. Why is he not here? I wondered. Then I panicked. Perhaps I was no longer interesting enough. As it turned out, I just couldn’t tell time. I was a whole 2 hours early. Suddenly George materialized online as I was sitting there fretting and asked if I wanted to go ahead and do the interview then. I said I would love to. He worked with me remotely to figure out my lighting, frowning as he did so. I thought he didn’t like me. I thought he was irritated because I’d messed with his schedule. He informed me that we were ready to begin shooting now that we had all our technical details sorted out and began smiling. I don’t think my husband would mind my saying that George is a very handsome man, because he is. I mean, rice is white and George is good looking – and those are just the facts. He welcomed me to the program and I sat there smiling back obliviously. Oh…me! He’s talking to me! “Thank you for having me!” I grinned back. Whew! The first part was done. The five questions that I was meant to be answering sat safely in my email, unread. With no time to fabricate either in depth or superficial answers, I adlibbed my way through the entire interview. Most of the answers I gave related to things that most of my readers know about me: That I’m 34, that I have 4 kids, that I love shoes, etc. George also managed to get out of me what only a select number of people know. I also write for Adventures From the Bedrooms of African Women under a pseudonym: Abena Gyekye. If you go to Adventuresfrom.com right now you’ll see my grinning mug staring back at you. After the interview was over, we had a chance to talk for a few minutes more. I told George that I really appreciated the work he was doing. I think it’s so important for Africans to be in control of the telling of our own stories. So much of the news coming out of the continent is about AIDS and malaria and war, so much so that the larger part of the world thinks that two African’s can’t have a loving (or lustful) relationship without contracting AIDS or go to sleep without catching malaria, or enjoying a holiday without having to look out for pirates. There is an old adage in newsrooms in the Western media: If it bleeds, it leads. We all know that this is why our evening news is dominated by homicides, arson, robbery, and anything else you generally don’t want to hear about after you’ve had a hard day at work. George’s features cover art, politics, music and literature, all of which are part of the African and human experience, and all of which are deserving of equal attention, if not more. I am honored that 5in5 is the first platform on which I am featured as a writer. What is this you ask? 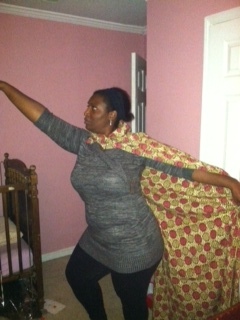 That is the cape I’m going to wear for all my interviews from now on. My superpower is wordsmithing.